Electro-optical tracking uses a combination of electronic and optical components to locate, and, if moving, follow an object of interest. The object of interest must emit or reflect electromagnetic radiation in a frequency range that the optics can focus onto a receiving device, which converts the radiation into electronic signals. Those signals may be assembled into an image understandable to a human, or merely used to provide positioning information to some device that needs to stay centered on the target. Electro-optical tracking can be used for observation, as in automated photography, even as simple as a handheld autofocus camera. It can be used for precision tracking, especially where a passive sensor is preferable to radar or other sources that an adversary can detect. It can be used to guide a heat-seeking air-to-air missile such as the AIM-9 Sidewinder or Vympel R-60, or a choice of visual light television, laser designation, or passive thermal energy on variants of the AGM-65 Maverick air-to-surface missile. It is an important part of intelligence collection for missile and other weapon technical information, using platforms such as the RC-135 COBRA BALL. Without considering yet how the system tracks, consider the relationships among the source of energy that will be tracked, the target, and the sensor. Unless the system is working in space, you must consider atmospheric effects. The atmosphere is opaque to certain infrared wavelengths, although some penetrate clouds quite nicely. If you think of a human brain as somewhat electronic, aiming and firing a rifle by sunlight is no more than Source 1a reflecting from the target to Sensor 2, the eye. A more annoying automated version substitutes a camera for Sensor 2, and takes pictures of cars violating traffic rules. For tracking a rocket flight, the system uses the brilliant exhaust plume generated by the target, received at sensor 2. 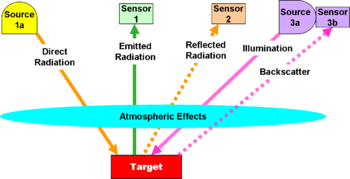 Air-to-air missile systems also use emitted radiation, but at much lower temperatures; the older infrared missiles needed to home on a jet exhaust, but now the difference netween the airframe and atmosphere is sufficient. The actual tracking system requires a lens that can be positioned to stay centered on the target. Centering can be by a precision motor drive on a ground pedestal, as with a space vehicle tracker, or direct signals to the fins or other controls of a guided missile. A typical motor drive gives feedback of its actual position, so there can be correction for friction in the mount. Signal processing, to delete noise and artifacts, and help keep the object of interest centered, is usually necessary before the decision and control system is given the signal. Depending on the application, the decision may be to record the imagery from the optical system, or simply to keep the target centered. Not all electro-optical systems form a human-recognizable image; missiles and distance trackers focus on the centroid of a light source, or perhaps its edge against background. The electro-optical system may include spectroscopic MASINT as electronic counter-countermeasures; modern man-portable air defense systems, such as the FIM-92 Stinger, track on multiple wavelengths that will not be generated by a simple decoy flare. This page was last modified 18:45, 7 February 2011.